Give your bathroom a new look and feel with this piece from Kraus. Turn your bathroom into a stylish space with this single-control faucet. This item's deck mounted design completes your bathroom with quick and easy set up. This faucet is WaterSense certified so it uses less water and energy. Aquila Single Hole 1-Handle High Arc Bathroom Faucet in Chrome with Lever Handle Give your bathroom a new look and feel with this piece from Kraus. Turn your bathroom into a stylish space with this single-control faucet. This item's deck mounted design completes your bathroom with quick and easy set up. 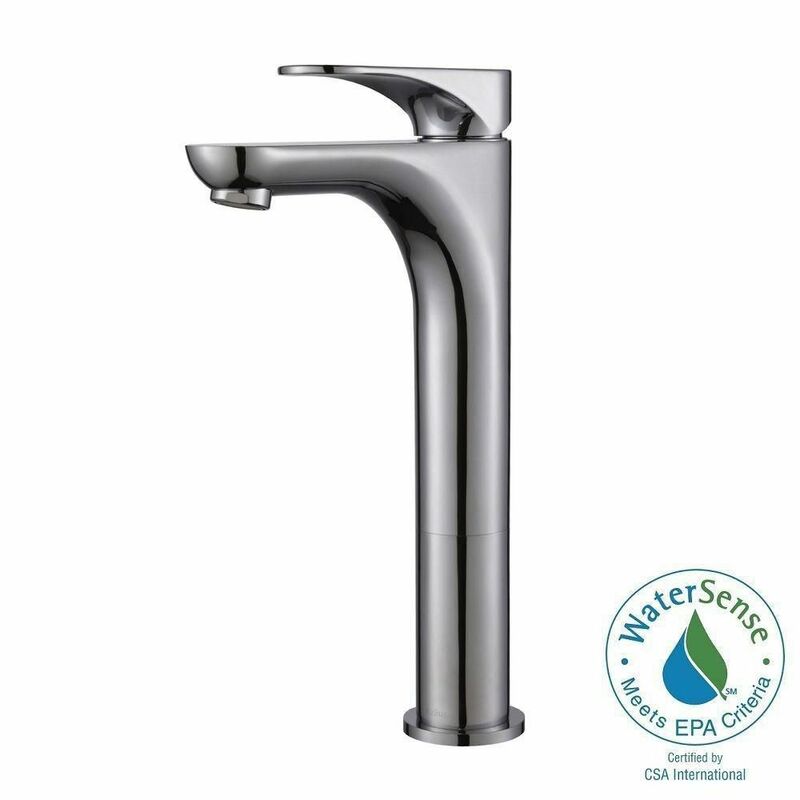 This faucet is WaterSense certified so it uses less water and energy. Aquila Single Hole 1-Handle High Arc Bathroom Faucet in Chrome with Lever Handle is rated 4.9 out of 5 by 11. Rated 5 out of 5 by na23 from I was surprised by the weight of the facet. It... I was surprised by the weight of the facet. It was a heavy facet. I love that it does not spray water when you open it. The flow is smooth and steady. Rated 5 out of 5 by SBB from Quality Faucet Contemporary faucet, easy to install and made of material which is of high quality. Perfect height to allow my medicine cabinet door to clear the faucet. Also like the fact that the spout is angled to project water away from side of sink. Rated 5 out of 5 by ddddddd from High quality vessel sink faucet This is a beautiful faucet. It was easy to install (very easy) and it works wonderfully! I had never heard of Kraus before but now it is the ONLY brand I will buy! Rated 5 out of 5 by Dave11 from Replacement for my first floor sink My wife and I absolutely love this faucet compared to the original one that came with our sink. Wish we had this 9 years ago. Rated 5 out of 5 by Leadball from Great looking and funtional Faucets we bought two for our new remodeled bathroom , and are very pleased with them.